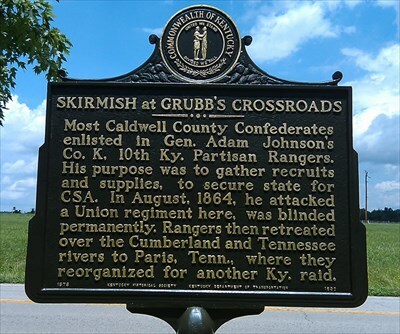 "Most Caldwell County Confederates enlisted in Gen. Adam Johnson's Co. K, 10th Ky. Partisan Rangers. His purpose was to gather recruits and supplies, to secure state for CSA. In August, 1864, he attacked a Union regiment here, was blinded permanently. Rangers then retreated over Cumberland and Tennessee rivers to Paris, Tenn., where they reorganized for another Ky. raid." Our Camp under took the project of relocating this marker to a more safe area of the intersection of the crossroads in 2010. We also had the marker professionally cleaned and repainted at that time. We are also part of the Kentucky Transportation Cabinet's Adopt-a-Highway program and take care of a stretch one mile in each direction of this marker. If you'd like to come help out during one of our cleanup days, you are more than welcome! Cleanup dates are posted on our Calendar of Events.